F all is in full swing with school, sports, and messy houses! Fall weather means everyone is about to start bringing the outdoors inside. Leaves, mud, snow, salt. How can you eliminate the mess? It’s time to utilize your entryway and mudroom areas. Creating custom storage solutions can make your trips in and out of the house fast, easy, and mess free. Leave the sports gear, backpacks, and boots at the door! Whether you want a complete entryway or mudroom transformation, or just need a few pieces, Brunsell has plenty of options that are right for your family. Cabinets and shelving are great for mudroom storage. Utilize these storage options for gloves, hats, scarves – everything you need to survive the Wisconsin winters. Don’t want to shuffle through miscellaneous winter supplies when you’re in a hurry? Place baskets on the shelves. Designate each item to a specific basket and you’ll find what you need in no time. Tuck away your bulky fall and winter items in a closet. This is a great option for coats, snow pants, and boots. Use a half or full closet hanging bar for coats and snow pants. The remaining space can be used for shelving, or a shoe rack. Cubbies aren’t just for school! This is a great storage solution for kids. Designate a cubby for each child. They’ll know just where to put all of their school and sports belongings and keep the clutter out of the rest of the house. This provides an easy grab and go system to manage hectic school day mornings. These are great for pet supplies such as, Dog & Cat food, toys, grooming equipment and food dishes. Hooks can be used for many things as well like, pet collars and leashes, kid’s book bags, coats, hats and umbrellas. Worried your added pieces won’t match up with your existing woodwork? 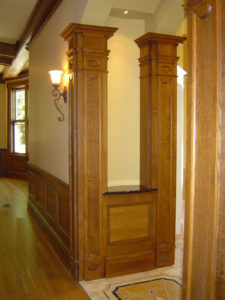 Not to worry, Brunsell’s millwork quality pieces can be custom made to match your existing moulding patterns. Or create something brand new, that’s unique to you! 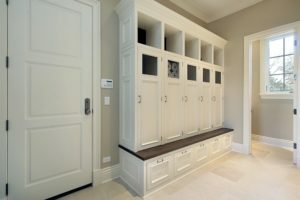 Using a few custom storage solutions for your entry or mudroom spaces can make a world of difference throughout the chaotic school year. Unsure how to best utilize the space you have? Contact us today to work together to create a space that will fit your lifestyle and budget. This entry was posted in Closets, Custom Cabinetry, Mudroom, Storage, Uncategorized and tagged Cabinets, custom cabinetry, Entry way, Fall Season, Mudroom, Storage. Bookmark the permalink.